Adult workers of common wasp measure about 12–17 mm (0.5–0.7 in) from head to abdomen, and have a mass of 84.1±19.0 mg, whereas the queen is about 20mm (0.8 in) long. It has aposematic colors of black and yellow; yellow pro-notal bands which are almost parallel to each other and black dots and rings on its abdomen. The common wasp queens and females appear very similar to the German wasps (or European wasp, Vespula germanica) except when they are seen head on, the common wasp face lacks the three black dots of Vespula germanica. Instead, each has only one black mark on its clypeus which is usually anchor-shaped or a dagger-shaped. However, sometimes the identification of this species might be difficult because this black mark on its clypeus can sometimes appear broken, making it again, look extremely similar to Vespula germanica. The common wasp has high adaptation skills regarding environments. Therefore, it is well off in most types of habitats, including the prairies, grassland, natural and planted forests, shrub lands and even in urban zones such as gardens, orchards and buildings. However, it does require the temperature to be moderately warm because its foraging activity is temperature dependent (has to be above 2 °C). Common wasp nests are made from chewed wood fibres mixed with the worker's saliva. It has open cells and a cylindrical column known as a "petiole" attaching the nest to the substrate. The wasps produce a chemical which repels ants and secrete it around the base of the petiole to avoid ant predation. 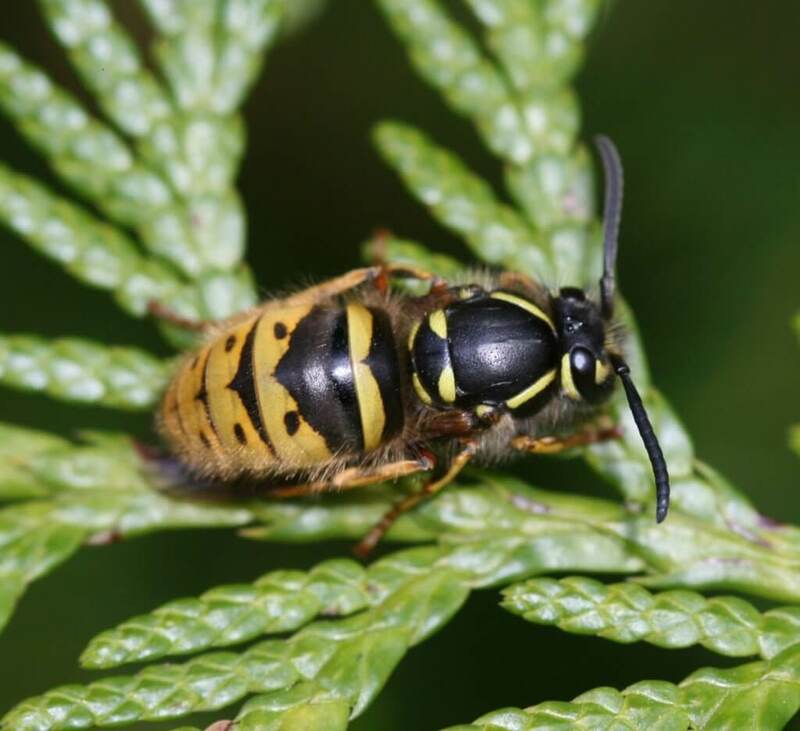 The extraordinarily good adaptation skill of the common wasp makes it possible to live in a wide range of habitats, from torrential areas to artificial environments such as gardens and human structures. However, this species along with other wasps species such as Vespula germanica, has immensely impacted the lives of many humans, especially those in New Zealand and Australia,n as its activities pose a great threat for the people. These wasps are the main culprits of damaging fruits, stinging people, adversely affecting tourism and hindering outdoor activities. You must always put your own health above that of a wasp. If a wasp lands on you wait for it to fly off or brush gently off with something like a small piece of paper (do not brush it with your hand). If you are faced with a wasp don’t challenge it - it is far better for you to leave the area (e.g. car, kitchen, picnic area) until the wasp has gone. Do not run or thrash or swat. If there is only one wasp, then keep still and, when safe, move to shade or away from what is attracting the wasp. If stinging seems inevitable, then cover your face with hands or clothing or get face-down on the ground. If there are multiple wasps then your removal to safety is urgent. If you find what appears to be an old and seemingly inactive wasp nest do not disturb it until you have been able to observe it in warm weather. There may still be living wasps inside.